1. Pruksa Real Estate Plc was still the largest developers with 25 projects launched during the first six months of 2018 at a total number of units of 5,348 or 12% in the total launched units. This involved 190.559 billion Baht or 588 million USD or some 10% of the total launching. 2. Although Sansiri Plc was the second in the number of units and projects launched, namely 12 projects at 4,293 units or 9% in the market. Its value constituted the largest at 22.801 billion Baht or 686 million USD which was accounted for 12% of the total value launched. 3. Of the total twenty largest companies, twelve were those listed companies; however, the other eight were private companies. Definitely, some of them would be listed in the future as well. 4. Chinese companies are growing substantially, the Tiancheng International Property Thailand Co.,Ltd. developed only one project with a total number of units of 1,957; however, its value was 11.340 billion Baht or 341 million USD which was ranked at No. 4 in terms of value. In addition, the BGY & TFD Property Co.,Ltd. which had only one project, 1,297 units at a value of 6.270 billion Baht or 189 million USD. 5. 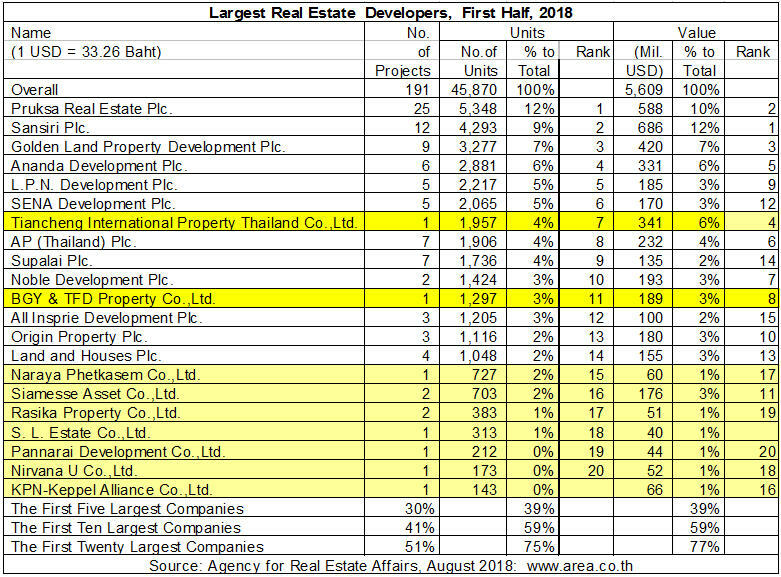 Of the first largest developers, their share was 30% in the number of projects launched but in terms of number of units and value, their share was accounted for 39% For the first 20 largest ones, the share was as high as 75% in terms of units and 77% in terms of value. However, even if there were big players, there would no monopoly in the markets. Dr.Sopon observed that because of the innovation of technology in terms of construction and finance, smaller or SMEs developers could not compete directly to the big players particularly those high-rise condominium projects. However, for SMEs ones, they could develop smaller or tailor-made projects.